Breathtaking views are calling. Savor the ever changing masterpiece of starry skies and clouds swirling over the mountains from the hot tub. Toast marshmallows over the custom, upgraded fire pit. An unforgettable vacation starts here. Millstone Lodge brings a touch of modern to the beauty of nature. From the vaulted windows letting in a spectacular view of the Great Smoky Mountains, to the wood floors and ceilings, you’ll love the "cabiny" feel of it. 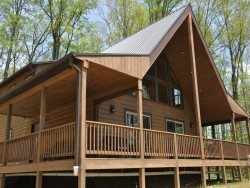 Secluded, this cabin has a beautiful view that you can enjoy from inside as well as from the screened porch or the covered porch. 2 Bedrooms & 2 Baths. The first bedroom has a king-size bed, porch access and a private bath with granite countertops with dual sinks and stone tile shower. The second bedroom has a queen-size bed with an access door to second full bathroom. The Video Room off the dining room/kitchen area has a TV and sleeper sofa for additional guests. This is a single level cabin. The dining room table is roomy and is big enough for you and anyone you should happen to invite over – it seats six. Plus there are four additional stools at the breakfast bar. We had a wonderfully relaxing weekend at Millstone Lodge. The perfect spot for a quiet get away. The location and price was perfect. The cabin is first class and clean and well maintained. It was clean and has a great view. It had everything we needed. The staff were very friendly and helpful. Our family had a wonderful few days here in the Smoky Mountains. We went Zip-Lining, hiking, mining, and took a train ride. Bryson City is beautiful. We came up here for the cooler weather, so snuggling up to the fireplace was wonderful. It was a great stay! Everyone at GSMCR went above and beyond. The staff is great. This cabin has a great view, high end furnishings. The night sky was beautiful from the cabin. We utilized the outdoor seating and fire pit as well as the indoor fireplace. The cabin was extremely clean. Are you sure this is a pet friendly cabin? No sign of stain and certainly no odors! It had everything needed to cook a meal (even a rock pot!) was stocked in the kitchen.We loved every minute and will definitely be back. We went hiking in the Smoky Mtns and enjoying the cooler fall temperatures. Amazing views, quiet and peaceful. First class luxury cabin in the Smokies that allows pets. And you would never know pets had been there. The cabin was BEAUTIFUL!!! My family and I have stayed in many cabins and this is the best one where we have vacationed. The floor plan was extremely functional and the view was breathtaking. We enjoyed all of the amenities such as the hot tub and the fire pit for roasting marshmallows. We will definitely be back! We loved our short stay at Millstone Lodge. Looking forward to future visits! Staff was friendly, helpful, and knowledgeable. We had a wonderful time in your cabin. It was perfect for 2 couples. We enjoyed the fire pit and the Hot Tub. We will definitely be back!! Thanks so much for sharing your home. Everything was absolutely beautiful! We couldn't have picked a better spot to celebrate our first anniversary of marriage :). Thank you everyone! The cabin and view were beautiful! We enjoyed our getaway and relaxation. Cabin was top notch. It was great. Had a fire going and of course made Smores, The Hot Tub was great! First morning, birds singing, hot cup of coffee - beautiful. Beautiful cabin!!! We spent a week here seeing some waterfalls and The Road to Nowhere. Hiked in Deep Creek. We bought some bird feed and watched the birds come up to the mountain side. While riding through the National Park, we saw a herd of Elk. That was a great sight to see. Thanks for having us. We will be back! We love Millstone Lodge! The view and that it is pet friendly is perfect for us. This was our 4th trip to beautiful Bryson City, each time trying to rent Millstone Lodge and it was always booked. This time we were successful and definitely worth the wait! We spent our days hiking trails with our dogs and evenings by the fireplace. We look forward to purchasing property here in the near future. Thank you again! Thank you. This is our second time here. It was great to be back. We loved the cabin and the mountain views. We drove in from Charleston, SC to take our 3 year old on the Polar Express. We had a great time! The cabin was very clean, quiet with wonderful views! We enjoyed our vacation. We had an awesome stay at this cabin. The views are amazing! We enjoyed Deep Creek and the waterfalls. Went on the train ride. It was a very relaxing and peaceful stay. Spent our honeymoon here and we returned to celebrate our one year anniversary. This cabin is so special to us and we were so happy to be able to come again. We saw a family of Deer and a cute little chipmunk. Had a blast at The Great Smoky Mtn Railroad. We can't wait to come again! Went for a few day getaway and could not have stayed anywhere better. It is magical! Such an amazing view- amazing songbirds- and a jacuzzi- HEAVEN. Can't wait to come back! You've got things to do and places to go in the Smokys, here is mileage in time and distance to the most popular attractions. Don't see what you're looking for? Just ask us and we'll be happy to help you.